There are investors who have a general idea that having debt is bad and having huge cash pile is good. Not necessarily so. Maybe some of us had learnt this in some of our finance courses and it’s basically text book answer, but it’s good that I reproduce it here for the benefit of those I encounter who are having this ‘debt is bad, cash is good’ idea. There is no doubt that I will actually prefer companies with high cash pile as cash could help to cushion the companies during downturns and gives financial flexibility for companies to undertake expansion projects etc. Nonetheless, having too much cash with little debt could also be a sign that companies are not utilizing their financial resources optimally. The main benefit of using debt in this regard is to help lower taxes. 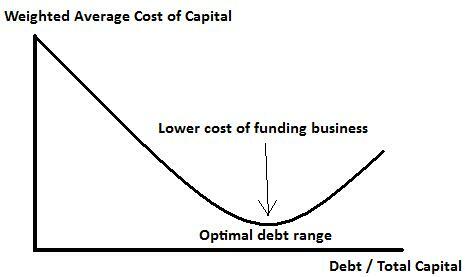 In simple words, higher finance cost means lower profits and thus lower taxes. As a result, the company’s value could be increased by the amount of these tax savings. However, there needs to be a balance between having debt for tax savings and the risks of default and bankruptcy due to high debt. The higher the debt, the riskier the business, the more difficult it is to raise funds when money is tight, and the higher the risk of default and even bankruptcy during downturns. Different companies have different methods of funding depending on the stage of growth of the companies and the industries they are involved in. Industries like utilities (Tenaga, MMC, Tanjong), telecom (Major ones like Maxis) and consumer (TWS) can afford higher debts owing to the resilience of their businesses. What does it matter if I borrow some money which I can repay in 10 years and my business is resilient regardless of the economic cycles, at the same time it helps me to pay less taxes and help me to fund expansion, acquisition or repurchase my own stocks which can lift up my share price? I will definitely go for it. 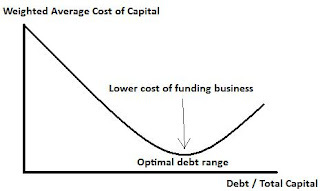 As for start-up companies like tech or highly cyclical companies, equities as source of funding will be more appropriate as their cyclical earnings (or no earnings at all) would not be able to service the debt if they opt for debt as their source of funds. 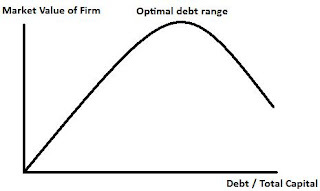 Therefore, it is imperative for us to analyze the company's debt levels individually, whether they are too excessive or risky for the companies, whether they have too little debt and can actually increase it for tax savings, whether companies with very high net cash position are utilizing their cash position more effectively. (2) Issuance of debt to repurchase stocks. (1) The company announces changes in long-term capital structure i.e. proportion of debt and equities. (2) Stock price will reflect the changes in capital structure. (3) Firm issues debt to repurchase stocks. (4) PE ratio decreases to reflect riskier EPS (Earnings per share) while EPS rises. (5) For lower levels of debt, stock price rises with higher debt. For increasing levels of debt, stock price will rise first and then fall as business gets riskier which will result in default and bankruptcy. PS: Helpful additions from snowball and KC. I think if cash is good if the management is known to deploy cash at the right time i.e. during a crisis to make acquisition probably YTL? But, those management are rare. Most will just chicken out during crisis and prefer to sit on their cash. Others has no good record of deploying cash and prefer to sit on it e.g. Genting. Sometimes, market tend to discount the cash on the balance sheet. So, certain companies may have a lot of cash but are trading at similar valuation with company in the same industry that has no cash. If the company indicate that they will be utilizing their cash to do buy back or acquisition, we may have a good catalyst for revaluation. Most of the times, cash hides the value of the business e.g. by artificially lowering the ROE and ROAs. If they can use it for expansion or buy backs, the value of business will be clearer." "The main purpose of investing is to maximize the "after tax" return of capital and the tax shield provided by debt as mentioned in the article has certainly done the job nicely. Instead of having so much non-operating cash, corporations with good cash flows and high EBIT margin (higher than the cost of borrowings)should instead return those cash to shareholders or buy back shares and then load up debt to a certain limit to get this free lunch from the government. ROE will also increase tremendously. for example, if Kfima (as just posted in this website) returns the 107m non-operating cash (40 sen per share)to the shareholders, it will still return the same operating numbers but ROE will improve further from 15% to 20%. As the balance sheet will still be very healthy, it can in fact borrow more and get even better ROE." Sometimes, market tend to discount the cash on the balance sheet. So, certain companies may have a lot of cash but are trading at similar valuation with company in the same industry that has no cash. If the company indicate that they will be utilizing their cash to do buy back or acquisition, we may have a good catalyst for revaluation. Most of the times, cash hides the value of the business e.g. by artificially lowering the ROE and ROAs. If they can use it for expansion or buy backs, the value of business will be clearer. The main purpose of investing is to maximize the "after tax" return of capital and the tax shield provided by debt as mentioned in the article has certainly done the job nicely. Instead of having so much non-operating cash, corporations with good cash flows and high EBIT margin (higher than the cost of borrowings)should instead return those cash to shareholders or buy back shares and then load up debt to a certain limit to get this free lunch from the government. ROE will also increase tremendously. for example, if Kfima (as just posted in this website) returns the 107m non-operating cash (40 sen per share)to the shareholders, it will still return the same operating numbers but ROE will improve further from 15% to 20%. As the balance sheet will still be very healthy, it can in fact borrow more and get even better ROE.